Hamburg had many factories and a military harbor with direct access to the sea. The two Flaktürme, actualy called Gefechtstürme, are the highlights. The AA towers have designations, IV and VI, which stipulates that there was a form of standardisation in the Reich. Comparable towers stood in Berlin and Vienna. Firecontrol for the batteries was conducted in separated big towers. In Hamburg no such Leittürme are left. We have also placed a casual finding in Flensburg temporarily in this chapter. All pictures by Henk Adriaanse, 2008 and 2014. 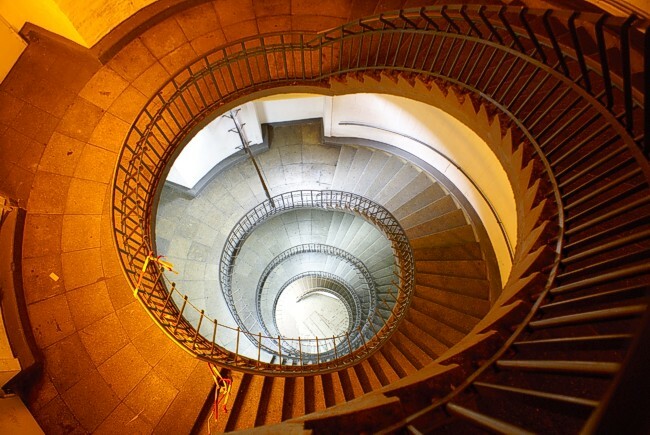 "Stairway to heaven", Flakturm IV, Hamburg.